Over at Rookery Waters fishery boss Alex Bates tells me that at last the whole complex has seen some much improved sport of late which was reflected in the weights in the latest Saturday Open match. Whittlesey rod Simon Godfrey took the honours with a pole and pellet approach from peg 38 catching steadily all day for 76lb 8oz. Jason Fulcher came second and also fished pellet to finish on 63lb 12oz, just ahead of Wayne Shepherd on 60lb 2oz. In the Steel City Open match fished on the Ferry Meadows lakes it was Ian Burdett topping the field with a net of bream going to the scales at 107lb 10oz. He fished feeder tactics but instead of the usual worm and caster approach he took everyone by surprise fishing chopped luncheon meat in a cage feeder. Second using the more conventional long range feeder tactics was Chris Hill with 82lb 10oz, then came Shane Hodgkinson on 77lb 10oz. Peterborough & DAA were also fishing at Ferry Meadows. They had the low numbers on the Overton Lake which saw Nigel Briggs take first place. 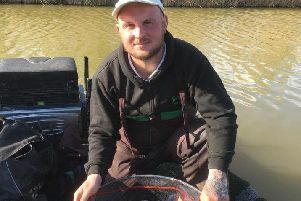 In a low-weight match he put 9lb 14oz of skimmers and bream to the scales taken from peg 14. Second was Alan Jopling, who had 6lb 6oz, and third Mel Saggers with 3lb 14oz. The last Angling Trust Pike Qualifier of the season, fished on the Ramsey Narrows section of the Forty Foot Drain, saw Mark Spies net three fish for a match-winning 18lb 8oz. Two pike for a total weight on 15lb 6oz put Paul Lenton into the runner-up position, then came Martin Smith with four small pike weighing in at 12lb 14oz.